Arrive ready to Dream Big in California, fly Air New Zealand. Our daily flights to California leave in the late afternoon arriving into Los Angeles in the evening. Perfect timing to grab a late supper, get some sleep and wake up refreshed and ready to start your 'Dream Big' adventure in America's Golden State. With inspiring landscapes, unreal icons and copious amounts of sunshine awaiting, you'll want to arrive ready to go! Our comfortable cabins and unrivalled in-flight services are designed to ensure that you do. So, sit back, relax and enjoy entertainment from the moment you step on board. We've got the latest Hollywood blockbusters, film classics and your favourite TV series, all ready to be watched whenever you are. You can feast on fresh, kiwi-inspired menus designed by our award-winning chefs, all served with complementary New Zealand wines selected by some of the world's leading wine experts. Not forgetting our snacks and drinks on-demand for when you want to sample a little extra something. If you'd like some extra space during your flight, simply stretch out and relax with our Economy Skycouch™ upgrade, It's just like having your own couch on the plane! Whether you're a couple who’d like a bit of extra room, a parent with a young child or travelling with two restless kids, you'll find our innovative Economy Skycouch™ is the perfect solution. This incredible option is available to passengers flying in our Economy cabin, creating a flexible space, that allows you to sit however you want. At the touch of a button the footrests beneath a row of three seats extends to provide a flat flexible space. With a length of 1.55m and width of 0.74m it really is like having your own couch on the plane. If you want to fly into the same city as you depart. 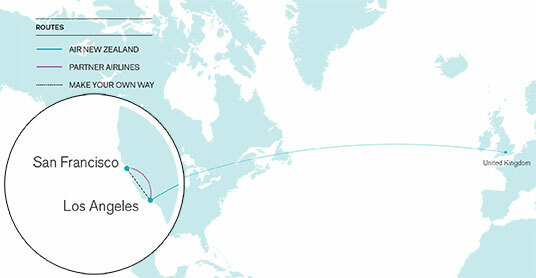 From London Heathrow, Air New Zealand offers direct flight to Los Angeles. Thanks to connecting flights with our partner airline, Alaska Airlines, you can also book flights to San Francisco (via Los Angeles). These bookings can be made through our standard booking tool. Through our multistop booking tool, Air New Zealand offers free stopovers in Los Angeles, in each direction, if you fly to San Francisco or other US destinations such as Seattle. An open-jaw is when you fly into one destination and return from another, without the need to book two seperate tickets. Therefore, if touring the idealic California coastline is one of your dreams, Air New Zealand has the perfect solution for you. With our multistop booking tool, you can easily book an open-jaw flying into Los Angeles and back from San Francisco (or vice versa) . You can also book your car hire with us. This is also available with other great US destinations including Las Vegas and Seattle. With so much to see and do in California it's important that you arrive refreshed and ready to take on everything this incredible state has to offer. From its exceptional wildlife to the incredibly diverse and unique geography, there is so much to see and do after we've helped to kick start your American adventure. As the country's most populous state, California is seen by many as a place of trendsetters retaining the pioneering spirit of the first gold rush settlers. The perfect place to begin your exploration. This spirit of adventure has meant some of the world's biggest tech companies were started here, with California claiming the title of 'birthplace of the internet'. It is also the birthplace and home to the movie industry with most of the world's biggest film studios based in and around Los Angeles. Many of these studios provide entertaining tours with names such as Disney and Universal Studios providing a great source of family fun. California boasts some of the world's most stunning natural wonders, with the Sierra Nevada mountains in the east, the Redwood-Douglass Fir forests in the northwest, and the Mojave Desert in the southeast (location of the world famous Death Valley). Sequoia National Park is home to the world's largest trees and contains more forest than any state other than Alaska. It also contains some of the oldest trees on earth, with one Bristlecone Pine estimated to be at least 5000 years old. Other natural attractions include Lake Tahoe on the northern fringes of Yosemite National Park, the perfect place to enjoy the outdoors hiking among the redwoods or river rafting. The Californian coast line boasts some spectacular scenery and you'll find a range of tours that will help you make the most of the sights and the exceptional wildlife along the coast. It's not just the wildlife that makes the most of the nearly 840 miles of coastline. Beaches such as Malibu, Pismo, and Laguna are frequented by surfers from all over the world thanks to the great surf all along the coast and the huge winter swells. With the water temperature rarely dropping below 18 degrees Celsius, what better place could there be to ride those waves! The state's wine production accounts for approximately 90% of total US wine output, and its varied climate and soil allows for a variety of different grapes to thrive. Notable wine regions in the area include the Napa Valley and Sonoma County. For wine lovers most vineyards provide tasting tours which will include talks on the process of wine making. Be sure to make the most of these with a chauffeur driven wine tour which are available in many of the wine growing regions. With such diverse terrain, stunning wildlife, and a number of major metropolitan areas, such as LA and San Francisco, there really is something for everyone in California. All passengers that travel to or via Los Angeles International Airport, must be travelling on their own machine readable passports and complete the ESTA online form at least 72 hours prior to departure from the UK. Fare/Price details - Prices are in GBP and include estimated government taxes, fuel surcharge, ticketing and handling fees. Fares are based on payment by debit card. Fare is subject to availability and may be withdrawn at any time. Unless otherwise stated above, fares are based on non-stop routings on Air New Zealand operated services from London to Los Angeles or routings to San Francisco, Las Vegas, and Seattle via Los Angeles with Air New Zealand and Alaska Airlines. Fare Listings are for general information only and not a reflection of current seat availability. Prices are subject to change at any time. We want to provide you with the most competitive fare deals in a fluctuating marketplace and because of this prices may go down. We are not able to provide refunds or rebookings if a lower fare becomes available. Fares are based on depatures on Monday, Tuesday, Wednesday and Thursday. Additional supplements may apply for departures on other travel days. Payment & Ticketing - Bookings made online must be purchased immediately with a debit or credit card. Payment with credit card will incur a credit card payment surcharge of £5.50 per person. Electronic Tickets will be issued for these fares. Stopovers - Available in Los Angeles when flying to San Francisco, Las Vegas, and Seattle.